Ever wondered why food tastes different in flight? Or how Delta delivers restaurant-level service in the sky, feeding thousands of customers each day? Meet Christian Hallowell, an accomplished chef and General Manager of On-Board Food & Beverage Design at Delta. For an episode of "How to Make It" — a video series produced by foodie favourite Eater — Christian took the show's host, chef Katie Pickens, behind-the-scenes at a Gate Gourmet kitchen in Atlanta to see how food is prepared, packaged, and delivered to customers at 30,000 feet. In many ways, preparing in-flight food is like preparing food at a restaurant. Delta works with local chefs in kitchens around the globe to prepare fresh meals daily for customers. But creating in-flight meals certainly presents challenges. For one – your taste buds are dulled in flight. To combat this, Christian's team focuses on creating menus with bolder, more vibrant mixes of herbs and spices to bring out the flavours and compensate for the altitude, and dryness in the cabin. 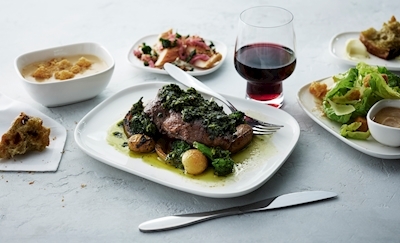 Delta introduced its new spring menu on 1st March and in the latest seasonal menu refresh, Delta One customers can look forward to reinvigorating flavours that help usher in springtime – from sweet, first-of-season Vidalia onions fresh from Georgia's G&R farms to bright herbs and crisp spring greens. As part of the airline's popular pre-select meal program, customers confirmed in the Delta One cabin will receive an email from Delta three days prior to their flight, asking them to pick their first-choice meal. Starting March 1, selections will include spring-inspired dishes like Seared Beef Tenderloin with wild garlic mashed potatoes and mixed spring vegetables or Vegetable Lasagna full of earthy mushrooms and delicate squash with pesto cream sauce. Depending on the route, menus will feature talents of the airline's in-house and partner chefs – like James Beard honoree Linton Hopkins out of Atlanta, Danny Meyer's Union Square Events out of New York, and Jon Shook and Vinny Dotolo out of L.A. Customers travelling between the U.S. and Asia can look forward to regionally sourced menus curated by Chinese chef Jereme Leung, Japanese chef Norio Ueno and Korean chef Kwon Woo-Joong. Spring menu snacksDelta's new spring meals will be complemented by a selection of wines curated by Delta's Master Sommelier, Andrea Robinson. Andrea's spring lineup includes regionally sourced wines chosen to perfectly pair with the latest menus, like Kleine Zalze Chenin Blanc from South Africa and Chateau Sainte Michelle Indian Wells Cabernet Sauvignon hailing from Washington's Columbia Valley. To keep selections fresh, Delta will introduce two new snack options this spring – bringing back fan favourite Squirrel Brand almonds and introducing Cheez-It crackers to the complimentary snack lineup. These options will be served in addition to the airline's beloved signature Biscoff cookies and gluten-free KIND Dark Chocolate Chunk Bars. 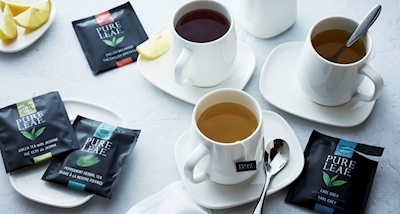 Starting this month, Delta will begin boarding new premium tea selections from Pure Leaf for Delta One customers to sip and savour in-fight. Flavours will include English Breakfast, Green Tea with Jasmine, Peppermint Herbal Tea and Earl Grey. Spring menu teasPure Leaf teas will also be available on the ground in Delta Sky Clubs starting May 1, where customers can find even more flavours to love – like Chamomile, Chai Tea, Ginger with Orange Blossom and Black Tea with Berries, as well as the four in-flight flavours. In addition to providing elevated flavour for customers, Pure Leaf teas align with Delta's industry-leading sustainability strategy. Every Pure Leaf product uses tea from Rainforest Alliance Certified tea estates around the world. Delta will also introduce Lipton, one of the world's best-selling tea brands, starting this month for customers seated in Delta Premium Select, First Class, Delta Comfort+ and Main Cabin. These culinary enchantments are part of Delta's multi-billion dollar investment in the overall customer experience. In the past several years, the airline has made significant enhancements to the Main Cabin experience including free Main Cabin meals on select coast-to-coast routes, free mobile messaging, free in-flight entertainment, upgraded Main Cabin snacks, the addition of sparkling wine, access to Wi-Fi on nearly all flights and refreshed Flight Fuel food-for-purchase options. Recent upgrades to the Delta One in-flight experience include new chef-designed Delta One menus, refreshed TUMI amenity kits with Kiehl's products, and an Alessi-designed collection of service ware.